This is the final part of an interview with Lis (La Mia Cucina) and Ivonne (Cream Puffs in Venice), founders of Daring Bakers. Be sure to start reading with part 1. This St. Honoré cake was the most daring thing that Ivonne has made with Daring Bakers. What’s the most daring thing that you've made with Daring Bakers? 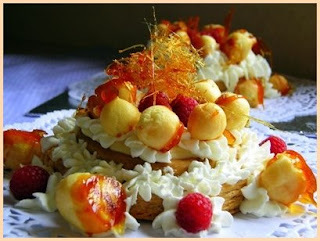 Ivonne: For me, it was the St. Honoré cake. The patron saint of French baking is this person called Saint Honoré and there is a cake that is named after this person and it’s a very famous French pastry. It involved making puff pastry from scratch. It was just unbelievable. It was a cake I’d eaten before and never in my wildest dreams would I have ever imagined that I would have actually made one in my house and that it would have tasted good - and I’m a pretty experienced home baker. I’m not the type of person that was just starting and still to me, I never thought I’d be able to do it. That was the most challenging one and most rewarding one. Lis: Mine was the crepe cake! Never in my life have I wanted to just sit in the middle of my kitchen and cry. Never in my life have I called The Martha so many names and I love her. It was rewarding after it was done and it was delicious, but how horrible that thing was. Ivonne: I’ve actually blocked the memory of that cake. Lis: Most of them did. Nobody likes to really talk about it without any bad words. If you were starting Daring Bakers over again, what would you do differently? Ivonne: We are really learning as we go along, so it’s hard to say. We would probably choose a different way of selecting a host or hostess. When we first started, we thought we would host according to the order you joined, which is all fine and dandy when you have 10 people, but when you have 700 people and you are now booking months in 2015 - it’s nice to be optimistic and all, but it’s a little bit much. The hosting is a bit of a pickle for us, so we now have to find a way to get more people hosting in a certain month - hopefully by having people pair up just so that we can give more people the opportunity to host. Beyond that, I can’t think of anything that we would do differently. Lis? Lis: Nothing other than the obvious stuff like having a website to go right at the very beginning, but you just don’t know. At the beginning, it was just a free-for-all and then we decided we needed some rules. If we did not make rules, this would just be chaos. Ivonne: I don’t even know if we’d exist if we didn’t have rules. Do you read every Daring Baker post? Lis and Ivonne: No. No. Lis: At the 500 point, she and I were just crying. It was, say, March 21st, and we weren’t even halfway through reading. We have volunteers now that help go through the whole blogroll and check to make sure everybody has done their challenge and we are hoping they are taking the time to comment. Unfortunately, the reading that Ivonne and I do has slipped down to hardly anything. I miss that. I have complained about that 100 times. I miss reading blogs. I just don’t have the time anymore. Ivonne: We started off with the best of intentions. But when it got to the 500-600 mark, we’d be posting the next month's challenge and I was still reading last’s month’s challenge. We finally realized that we just couldn’t do it. Ivonne: I’m a writer and coordinator with the government of Ontario. Basically what that means is that I spend my days writing a lot of communications products and coordinating a lot of reports and other various projects that we have. Lis: I’m an office manager for a commercial roofing company. I won’t even tell you what I do because it’s so boring. It’s non-stop, but it’s boring. How did you both start food blogging? Lis: The funniest thing for me was that I never read too many cooking blogs. There are some hysterical women out there with their kids. I don’t even have kids, so I don’t know what got me started on it. I think I found Amalah one day. She’s hysterical. I still read her. I don’t know how I found my first cooking blog, but when I saw it, I thought, "What a neat idea!" My family used to have an Italian restaurant and there are so many recipes I wanted to keep in an online diary that I could just go and bring up on my computer. I really never even guessed I would make one friend, let alone thousands. It was never really a social thing for me, it was pretty much just keeping a diary and it blossomed. I love it. Ivonne: For me it was it back in 2005. I read an article in the newspaper about a blog called Chocolate and Zucchini, which is obviously a very famous food blog. I had no idea what blogging was or how you did it, but after reading about this blog and visiting, I just started visiting others and the next thing you know, I’m reading food blogs all the time. When I finally figured out that it was easy to do and free to do as long as you have a camera, I just thought, “OK – I’ll set up a blog.” So that’s what I did! Who would you interview about food? Ivonne: I was going to say George Clooney – but I want to keep it in the world of food. Lis: Pretty soon he’ll be too busy being our assistant. Ivonne: That’s a secret, Stefani. Don’t let that cat out of the bag! Three people come to mind right away. If she was still living, I would love to interview Julia Child just because I am a big fan of her baking and her style of cooking and I just think she’s the kind of person that I would want to sit down and have a meal with. Second would be Nigella Lawson. Again, same thing - I just love the way she approaches food. The third person would be Lidia Bastianich. She’s an Italian chef who has a couple of restaurants in New York and again she’s so authentic and so pure and shows such a love of cooking that she’s definitely someone I’d love to meet. Lis: Gordon Ramsey would be on the top of my list. Ivonne: I knew you were going to say that. That’s the first thing I thought - I know Lis is going to say Gordon Ramsey. Lis: Because I want to know if he’s really that much of a “lovely person.” I’d like to see how he really looks in those tight jeans of his. Then of course, there’s The Martha. I love her! I think that she’s just an amazing woman and everything that she’s pulled and gotten away with. I aspire to be Martha one day. I guess I have to go celebrity cook again and say Paula Dean, because I would like her to have my children one day or I would like her to adopt me and feed me and just be my mom. Ivonne: If she’s your mom, can I have one of her diamond rings? Lis: Yes. Since you’re my sister, so she’d be your mom, too. Ivonne: But, then I wouldn’t be able to marry one of her sons. heee! Thank you so much AGAIN, Stef! Being interviewed by you was fun and I really enjoyed meeting you! It is always a blast. I read both iterviews and you 2 did a great job!! thanks for starting the daring bakers and making it what is is today! Yup that sounds like the Lis and Ivonne I've come to know and love over the years! Great job ladies! Came here from Lisa's blog. Glad everyone enjoyed the interview. It was such fun to do! Great interview fearless leaders! Glad you are Daring Bakers and have been willing to grow it and love it all the while. Thanks for letting me be a part of it and asking me to join a while back...it has been such a pleasure each month to discover how much there is to learn and how fun baking can be. That was one great interview! I truly enjoyed reading this! Such a sweet interview! Thanks Lis & Ivonne again and again!